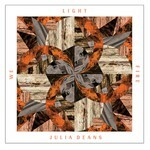 The album has been recorded in a home studio in Northcote, Auckland, which Julia's partner David Wernham built over the course of six months 2011, and she began writing the songs not long after. Many of them began with Deans mucking around with a variety of keyboard and synth sounds, in part because she was drawn to them, but also because, despite being known for her excellent guitar skills, wanted to try something new. While writing the songs was a very solo pursuit, the recording of them was less so, with Deans working closely with Wernham on "pulling the musical story together". And though Deans also plays many of the instruments on the record herself, she also roped in an impressive list of friends to sprinkle their abilities across the tracks too, including Nick Gaffaney, Steve Bremner, Richie Pickard, Mareea Patterson, Anna Coddington, Annie Crummer, Tama Waipara, and Anika Moa.